TXAB: The Christ Almighty Blog: Son of God and cheesy Jesus movies. Son of God and cheesy Jesus movies. Why is it the label “Christian” on movies, music, and fiction is so often synonymous with “junk”? 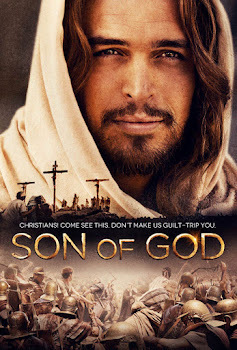 When Son of God hit the theaters February 2014, various people at my church were talking about it like it was the Second Coming of Christ. In fact, I got in some minor trouble ’cause I joked about this when I was presenting our church’s weekly announcements. Humor-deprived Christians merit a whole other rant. But not today. A Jesus movie! In the theaters! In wide release!—not just playing in the hard-to-find specialty theaters in major cities and college towns. Produced by Hollywood producers! (Well, Mark Burnett and Roma Downey, anyway; she got to play Jesus’s mom.) Public vindication of everything we Christians hold dear! Meh. I’m not one of those Christians who are just thrilled to pieces every time Hollywood decides to pander to my demographic with a bible movie. Largely because they get so much wrong. And y’know, they get it wrong even when they’re fellow Christians. Because—for the very same reason they so often get their theology wrong—they assume they know more than they do, never consult with experts, hire overeager over-actors instead of good actors, try to “improve” the story by padding it with stuff which is guaranteed to annoy the many, many purists among us… and the result is junk. Burnett and Downey produced the awful History Channel miniseries The Bible, which had already done all this and more. Then they did it again, back round Easter 2015, with their awful NBC miniseries A.D.: The Bible Continues.) I saw just enough of it to realize Son of God was gonna be just as awful. So I didn’t bother to watch it myself till Netflix got it. There’s two hours, 18 minutes (less; I skipped the credits) I’m not getting back. Is quality too much to ask for? Christians are forgiving. Well, most of us. Well, we should be. Now, while forgiveness and grace are excellent qualities when it comes to the sins of others, Christians tend to give those folks a miss… then apply it primarily to Christian musicians, artists, and filmmakers. As a result Christendom is inundated with substandard slop. The Renaissance it ain’t. I would also prefer to support our own… but my money needs to support the growth of God’s kingdom, and supporting mediocrity doesn’t actually do this. It encourages more mediocrity. It makes outsiders realize Christians are happy to settle for crap. Why do you think they so often try to sell us crap? If we’re gonna write Christian novels, create Christian pop music, produce Christian movies, and otherwise manufacture things which are meant to entertain, I personally require them to be at the same level of quality pagans produce. Ideally better than pagans. If we Christians are doing this stuff for our Lord, as we so often claim, there’s no excuse whatsoever to not strive to outdo everyone else in the cosmos. Everyone. You know, like Renaissance artists tried to do. But this ain’t the case. Christians aren’t known anymore for the best and brightest. We’re known for producing inferior knock-offs. That’s our reputation now. Some of the reason is our entertainers have no taste. No sense of style, no recognition for quality, no pursuit of excellence in their craft. They produce crummy Christian knock-offs because they want Christian alternatives to the pagan stuff, but don’t know how to make them, and don’t care if they’re good: They know we’ll settle for good enough. They know we’ll forgive their inability because we recognize their good intentions. 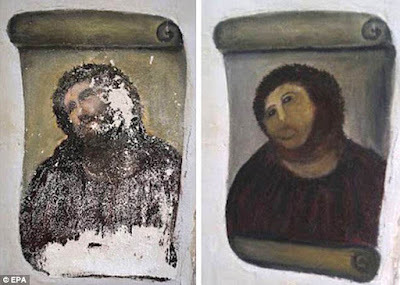 Take Cecilia Jimenez, the Spanish woman who wanted to “fix” a fresco of Jesus, Ecce Homo, which was flaking away at her church. So, back in 2012, she took a paintbrush to it. The best of intentions, but she ruined the art. There was a fair amount of outcry, and rightly so: She wasn’t qualified to “fix” anything! She certainly didn’t. Yet I know loads of Christians who shrug and say, “But she meant well.” Doesn’t matter if she meant well. She really shouldn’t have. Likewise many people who work in Christian arts and entertainment really shouldn’t. But they don’t know they’re making junk. ’Cause we, their fellow Christians, aren’t honest with them. We want to encourage them, in the hopes they’ll get better. Well they’re not getting better. And like a child who gets way too many trophies for participation, they’re kinda dense about their deficiencies. Just like the folks who tragicomically try out for American Idol and similar reality shows, and can’t fathom why the judges won’t let ’em on the show to follow their dreams. All their friends and family tell them they’re great! How dare those judges tell them any different. There’s a subcategory of that group: Christians who deliberately produce rubbish. They figure we Christians are happy to get anything, and will forgive them their limitations. I worked for such a guy. He could care less about inferior product, as long as his stuff was out there and people were buying it. At least the folks who are untalented but don’t know it, are earnest about it. These junkmakers have no excuse. Anyway, you can see where I’m going. Son of God falls into the same vat of melodramatic sludge we find all over Christendom. The only reason it got produced was because Burnett and Downey have been successful at other things. Burnett is known for reality television. Downey, mostly for Touched By an Angel—which isn’t a bad show, but she didn’t write it. They had enough pull in the business to get The Bible on the air, and Son of God is a spinoff. First I heard of The Bible, I thought it was a documentary. After all, it was on the History Channel. (Though if you know anything about that network, their definition of “documentary” and “history” and “fact” is looser than my stool on a Daniel fast.) I didn’t assume it’d be a good documentary; I figured it’d be like one of Burnett’s reality shows, where they artificially ramp up the drama with clever editing and music. Turns out it was a really cheesy miniseries. Overacting, unnecessary special effects, a lot of liberties taken with the biblical text—which can be forgivable when they make the story more entertaining, but they didn’t. After I watched the first episode, featuring Abraham, I decided that was plenty. Son of God was more of the same: A melodramatic portrayal of Jesus’s life, in which Jesus’s goal is to “change the world.” But it never explained how he changed it. Movie-Jesus spoke very little about God’s kingdom. Seems we get to live forever, but nothing about how or why or what it’s like. Or what we do now. Right after Movie-Jesus ascended into heaven, Movie-Peter got up and says, “Well, let’s get to work.” To work doing what? Founding Christianity? Building churches? Making converts? Was that even Jesus’s idea in the first place? Is accuracy too much to ask for? I read some mommy blogger’s review of Son of God last year. Her kids were surprised she’d let ’em watch a PG-13 movie—rated that way ’cause whipping and crucifixion, of course. But she figured, as so many of us did with The Passion of the Christ, “Well, that did happen.” So off they went. She liked it. But she had concerns. Mostly they had to do with biblical accuracy. ’Cause that’s the biggest hangup bible-loving Christians have with bible movies: If you can’t follow the scriptures word-for-word, you can at least stick to the general idea. But in Son of God, she missed many of her favorite teachings and miracles and stories. Movie-Jesus said many things Real Jesus did, but not always in the proper context. She was annoyed by the bits they just plain got wrong. Mary the Magdalene appeared to be one of the Twelve—and while she was around a lot, it’s doubtful she went everywhere with Jesus. Judas Iscariot was toned down a lot—he’s not a traitor who ratted out Jesus to the Jewish senate, but someone who was trying to start a dialogue between the two, and killed himself in despair once things went awry. These kinds of things used to bug me too. Eventually I realized these are only movies. Not documentaries. For budgetary and dramatic reasons, or because they’re trying to pack days’ worth of material into two hours, stuff’s always gonna fall by the wayside. And the filmmakers are rarely bible scholars: They’re gonna be clueless about the details they did skip, or just won’t care. Like how George Stevens, in making The Greatest Story Ever Told, didn’t care how little Max von Sydow resembled a first-century Palestinian Jew. Nor how little the American southwest resembled Palestine. What does bug me about Jesus movies is how every one of them (except the word-for-word movies) insists on padding the stories of Herod, Pilate, and Caiaphas. They want it made crystal clear these are the bad guys, and they’re so bad. Boo at them! Cheer for Jesus and the apostles. A.D. was particularly guilty of this one: Half the show (till I gave up on it and stopped watching) was about Pilate wanting to slaughter Jews, and Caipahas trying to talk him out of it—yet himself wanting to slaughter Christians. What about the acts of the apostles? Proclaiming Jesus, acts of compassion, Spirit-empowered miracles? Meh. Not as exciting. Focus on the bad guys. My other pet peeve—not just in Jesus movies—is how everybody in ancient times is obligated to speak with a British accent. Even when, like Son of God, they’re American productions, and the cast is full of Americans. After I saw how The Nativity Story went with Israeli accents, I’ve been ruined for all future Jesus movies: If they’ve gotta do fake accents, at least make ’em do appropriate fake accents. Is acting too much to… oh nevermind. But nothing bugs me like a lame script and overacting. In any movie. And there’s lots of that in Son of God. I’ve seen the Jesus story performed by good actors. The Gospel of John went with Royal Shakespeare Company-caliber actors instead of overactors, and was excellent. There are good screenwriters and actors out there who can write and give realistic, thoughtful portrayals of the folks in the bible. Burnett and Downey didn’t hire ’em. They went with big, showy, flashy, dramatic—they even hired Hans Zimmer to do the music, which I realized as soon as I noticed the music reminded me an awful lot of Batman Begins. So there’s my review: There are way better Jesus movies out there. Watch one of them. Gospel of John is my current favorite; go with that one.